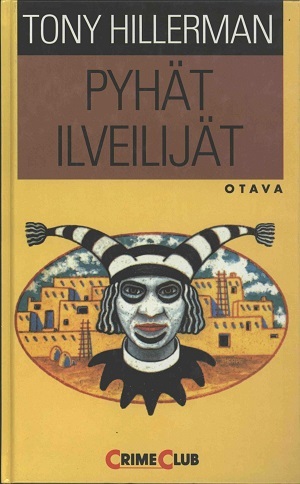 This is the Finnish hardback edition of Sacred Clowns, published by Otava in Helsinki, Finland. This edition is a Crime Club novel which is a division of the Finnish publishing house, Otava, that printed crime novels from 1989 till 2008. The text was translated into Finnish by Ilkka Terho. The cover design is not credited but reproduces the cover for first Harper Collins edition created by Peter Thorpe. The cover depicts a koshare or Pueblo Clown with an Ancient Pueblo house behind the clown. Format: Hardback, 21.4 x 13.5 cm. Binding: Full color boards with the Crime Club logo printed horizontally in red and the author's name and the title printed vertically in white on the spine.